About Mega Chomp Lure Co.
Mega Chomp Lure Co. is a custom lure manufacturer in small town America that was founded by bass fishermen for the purpose of building high quality lures for fisherpersons. After 40 years of bass fishing and 30+ year of lure building, I decided to build a company with the intent of sharing my creations with others. I have long enjoyed the pleasure of catching fish on the lures that I build but love hearing the stories of others having success on our lures (feel free to share yours through the contact us link, we’d love to hear them). Mega Chomp lures are proudly built in the U.S.A. with as many American made components as possible. Each lure is hand crafted one at a time using Worth components, Mustad hooks, and painted with 100% powder paint for quality and durability. 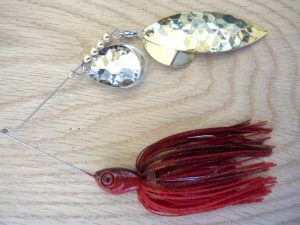 These lures are made to keep fishermen and women catching the big ones for years to come.